BF Homes in the South is a wonderful place to explore when you’re looking for new things to eat. Because of it’s being a residential subdivision though, parking can be difficult, so we’re not able to drop by as much as we’d like. Still, when we do make time to visit, we’re rewarded by delicious meals. 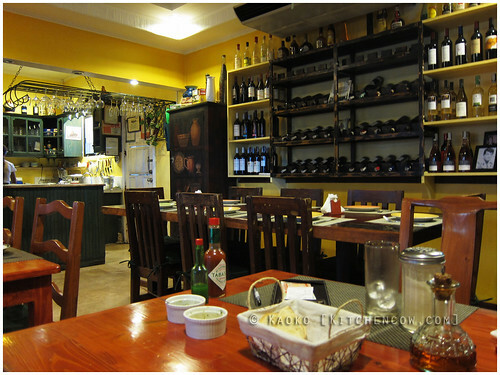 During one such visit, we were rewarded with a gem of a restaurant called named Mama Lou’s. 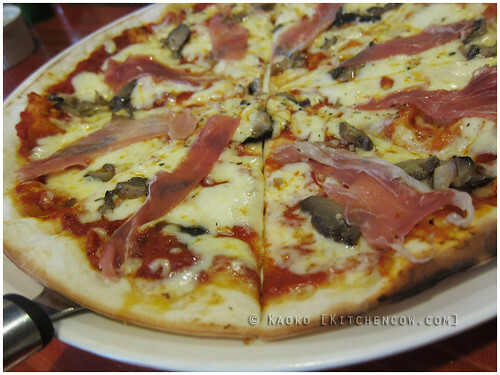 A home converted into an Italian restaurant, Mama Lou’s has a laid-back, homey ambiance that speaks of lazy days, dressing down and the warm company of friends. Eating here feels like being invited to a friend’s home for a meal and conversation. Bacon Poutine. I’ll forgive you if you want to lick the plate clean. Granted, I was initially confused when I opened the menu. There’s pizza, pasta, and poutine? Isn’t poutine Canadian? Well, regardless, we ordered a plate and was rewarded with hand-cut fried potatoes, smothered with bacon pieces (not bits, pieces! ), gravy and cheese. It was greasy. It was salty. It was messy. I LOVED IT. Aside from the poutine, we also had a light salad to start with. The friuliana had your usual greens, thinly sliced tomatoes and cucumbers, hardboiled eggs, bacon and shiitake mushrooms, doused in Italian vinaigrette. 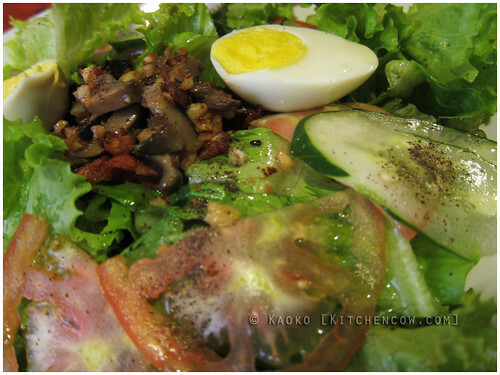 The shiitake mushrooms stood out in the salad, adding a meaty bite to the generally light mix. We also ordered a small pizza al funghi. The crust was thin and crunchy, reminding me of Greek-style pita pizzas. Our was topped with mushrooms and pancetta. Can’t go wrong with meat and mushrooms on a pizza, right? 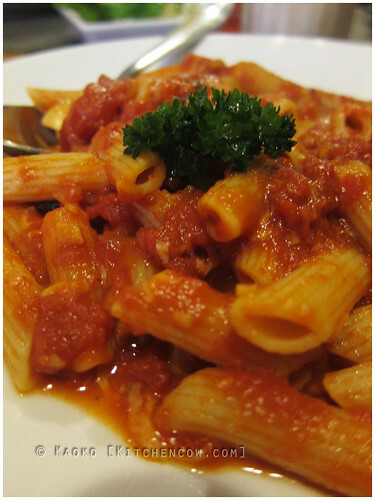 For pasta, we got the penne al telefono, a very basic tomato, basil and cheese pasta. Because it’s tomato-based, it was rich yet refreshing, with just the right amount of acidity to contrast with the other dishes. What I love about Mama Lou’s is how simple yet satisfying the fare is. It’s not your fancy schmancy Italian restaurant where you’re afraid of mispronouncing what you’re trying to order. Mama Lou’s is quite the opposite. Here, the place welcomes you like an old friend, inviting you to pull up a chair and grab a bite from their table. And it’s a table you’ll gladly join. I want that Bacon Poutine. Can they find a way to transport it over here, its seriously far away. I dunno Richard, but I read somewhere that they have a stall at Soderno. Mebbe you can grab some there? It’s as far, but at least it’s more accessible. This sounds nice! I live in the South but haven’t heard of this, maybe coz I don’t frequent that part of BF anymore. Tough naman kasi magpark sa BF. Plus, there’s just so many restaurants mushrooming there, it’s tough to pick what’s worth the effort. That’s wonderful! I love the setting and the ambiance, look like small cafes here in Auckland and they’re always packed full and food is lovely. Back in Beijing, we love ‘home restaurants’. People with day jobs but cook and serve dinner or lunch to few guests on certain days or weekends ‘by appointment only’. Fantastic food! I love the idea! A restaurant fueled by passion. Hi Chrissie. 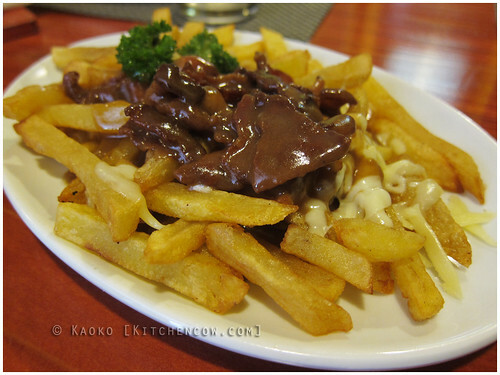 The resto is the owner’s house too:) They offer the poutine because the resto patriarch is Franch-Canadian? i agree, it’s very cozy. They sell the panzarotti at Soderno…it’s their take on calzone. This is too far away from me; but I’d love to try this out. Often times, this type of resto would suit my palate more than my usual favorite ones.